The movie King Arthur Legend of The Sword: trailer, clips, photos, soundtrack, news and much more! Even without visual effects the behind-the-scenes footage of King Arthur looks really exciting! King Arthur Legend of the Sword – Both hands! King Arthur Legend of the Sword – Take it! Guy Ritchie’s take on the tale of King Arthur is going to be epic, I can’t wait to see the whole thing on the big screen! Does temptation really blacken the heart? Anyway, from nothing comes a king! Who is your favorite character in the movie King Arthur? The film will hit theaters on May 12, 2017. Will the Transformers show up and save the day? lol! In theaters: May 12, 2017. Guy Ritchie’s King Arthur promises to be one entertaining take on the legendary king of Camelot! From nothing comes a king! From the Director of “Sherlock Holmes”. Besides Charlie Hunnam and Jude Law, the cast also includes Eric Bana, Djimon Hounsou, Astrid Berges-Frisbey, Annabelle Wallis, Aidan Gillen, and Michael McElhatton. Never heard about King Arthur? Don’t worry, you’ll soon know what the fuss is all about! Besides Charlie Hunnam, the cast also includes Jude Law, Eric Bana, Djimon Hounsou, Astrid Berges-Frisbey, Annabelle Wallis, Aidan Gillen, and Michael McElhatton. The movie King Arthur is set to open in theaters on May 12, 2017. By the way if you’re wondering about the song int his trailer of King Arthur, it’s the song “Babe I’m Gonna Leave You” by Led Zeppelin. So do you root for Jude Law or Charlie Hunnam? Why? Tell us in the comments below! – and Eric Bana as Arthur’s father, King Uther Pendragon. Are you excited about this new iconoclastic take on the classic Excalibur myth? And does Actor Charlie Hunnam look the part as the man who pulled the sword from the stone? Tell us in the comments below! The film will open in theaters on March 24, 2017. You may recognize Charlie Hunnam as not-yet-king Arthur and Jude Law as his Uncle Vortigern. The release date of the movie King Arthur Legend of The Sword is set to March 24, 2017. 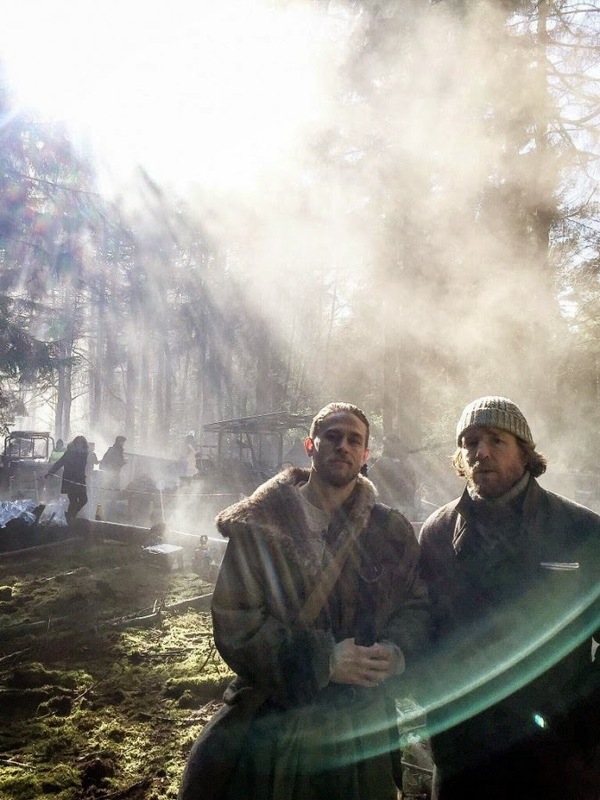 You may recognize Actor Charlie Hunnam as Arthur and Director Guy Ritchie. I wish Charlie Hunnam would focus on piloting his Jaeger (yep am referring to his giant robot from Pacific Rim) instead of toying around with a small sword (take that Excalibur!). But well, since Guy Ritchie is involved, I guess it will be an entertaining movie. The release date of Knights of the Round Table King Arthur is set to July 22, 2016.